It seemed like a normal day in the kitchen for Glens Falls resident Melissa Doney; that is, until the camera crew showed up at the Lake George resturant she works at, the Fort William Henry. The 32-year old is one of the 16 chefs competing on "Hell's Kitchen." What does she credit to her success? Her personality, of course, but something else, too. A crate! Yes, a crate. Doney kicks a crate around her kitchen so that her four-foot-ten frame can reach necessary places and spaces. Though her first cracks at the hellish kitchen haven't been a roaring success, others have done much worse, moving Doney forward, offering hope for those following her progess. Keep an eye to the show and hopefully we will be seeing a familiar face in the final episodes! 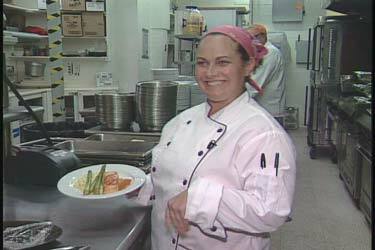 Glens Falls Doctor Turned Into Famous "Chef"